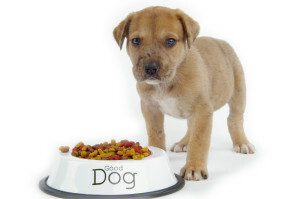 Reward man’s best friend with nutritional and yummy grub with these homemade dog food recipes. It is true that raising pets, a dog in this case, should be fun and fulfilling. But the rising cost of commercial dog food is taking out much of the fun (and the dollars from your wallet). Furthermore, some of the cheaper brands’ nutritional values are questionable. The solution: homemade dog food. There are 2 schools of thought when it comes to homemade dog food. There are those that argue that raw food is best for your canine. Raw food advocates reason that dogs are not meant to eat processed chow because they used to hunt their food in the wild anyway. There are also those who prefer to have the food for their dogs cooked because it’s much safer. Even though dogs are not as susceptible to food-borne organisms, prepared food advocates still thinks it’s better to be safe than sorry. Our take: Raw food and prepared food are both good for your dog when they’re homemade. So here are some recipes to help you out. First we’ll feature raw food for dogs, also known as BARF (Biologically Appropriate Raw Food)—which is basically raw meat and bones. Mix everything in a bowl and serve in chunks. The Unstew can be stored in the refrigerator to extend shelf life. This should cost you under $10 and a little over 5 minutes to mix. 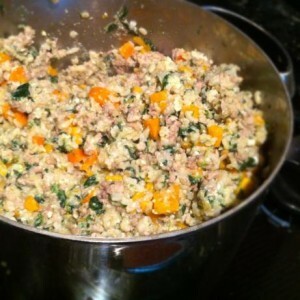 This recipe is so simple you just need to pile all ingredients into your dog’s dish. Organic Wings and Things cost $7.00 and should only take less than 5 minutes to prepare. To mix things up, offer your dog non-meat recipes from time to time. You will find that your dog will respond well to fruits and vegetables. Combine everything in a bowl and refrigerate leftovers for the next day. This recipe should cost $10 and shouldn’t take more than 10 minutes to prepare. Again, just combine all ingredients and serve. Total cost of this recipe is $3.50 and shouldn’t take more than 10 minutes to whip up. Add everything to a large pot and boil. Add rice once veggies become tender. You can add more water if needed. This recipe costs only $3.50 and takes about 40 minutes to prepare. Combine the salmon, beaten egg and cornmeal. Form into patties and sauté in a frying pan until thoroughly cooked. Chop up patties afterwards. Steam vegetables and chop them up as well. Combine the chopped-up veggies with the chopped-up patties and serve. This costs $4.50 and half an hour to prepare. There you have it: healthy homemade dog food recipes that are fun to make and easy on the budget. Whip these recipes, your dog will surely love you for it. Don’t be a slave to commercial dog food. Try these recipes now.